Although it is not necessary to be an expert about window film brands and types, it will help to have a little bit of background so you can make an educated purchase. This applies to both professional automotive installation and DIY installation. This article will explain the most popular types of automotive films to look for. This aspect may seem irrelevant, but is one of the most important factors when deciding on a window film. Automotive films generally get their color from either a dye or a layer of metal. Dyed films typically will fade faster over time and do not reject as much light and heat as a film with metal. Metallized films, however, can interfere with your radio or GPS inside the car. Unless you insist on having a metallized film, be sure to ask for a high quality, non-reflective automotive film. Non-metallized films are always the more popular way to go. You can view all the most popular types of automotive films here. Because automotive film has to be heat-shrunk onto the window, the ability of a film to shrink down easily is extremely important. This ability won’t be obvious or even stated in the product description, so be sure and ask. Any legitimate window film dealer will know all about this and explain how their film shrinks. 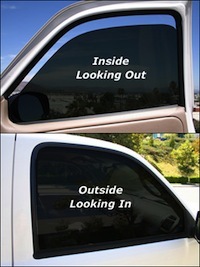 One of the best sites to purchase automotive window film from is WindowTint.com. They have a complete collection of high quality automotive window films for the do-it-yourselfer. They carry non-metallic films, nano-ceramic films, high performance films and color automotive films. These films are available in rolls and some in pre-cut automotive kits cut to fit your vehicle.